When Adi Hed and Tamir Elghanayan were enterprising young college students in 2003, they took the initiative to start their own business in Westwood, California. Settling on the name Tadi Brothers, the duo initially focused on automotive electronics like car radios and DVD players. They did well in their niche, but it wasn’t long before they noticed a massive opportunity. Surprisingly, they were seeing a huge demand for digital backup camera kits, yet there were very few quality products on the market. Being savvy businessmen, Adi and Tamir quickly moved to fill this gap in the market. Before long, they were designing and manufacturing their very own range of backup cameras—and they were a hit with Tadi Brothers’ customers. Today, they sell backup cameras for everything from RVs to wheelchairs. Online sales have been a big part of Tadi Brothers’ business since the early days, so Adi and Tamir are always on the lookout for ways to attract more customers to their website and boost their conversion rate. Inevitably, this led them to the realization that they needed to come up with an SEO strategy. 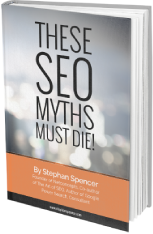 After many hours of online research and a few false starts with SEO consultants, Adi and Tamir discovered Stephan via his book, The Art of SEO. They were impressed by the expert-level knowledge of the book, and over the coming months, they began to notice Stephan’s name again and again in their research. Since it was clear that Stephan was one of the leading practitioners in the SEO industry, Adi and Tamir decided to give him a call. Adi and Tamir’s main problem was that they were lagging behind their competitors for key terms in their niche like “backup camera”. When they approached Stephan, their main goal was to achieve top 10 rankings for the major high-traffic terms in the backup camera and automotive electronics niche. The first thing Stephan suggested was a thorough audit of the Tadi Brothers website. Adi and Tamir agreed. Almost immediately, Stephan noticed a number of issues that were holding Tadi Brothers back. Not only were many product pages suffering from over-optimization and a slew of technical issues, but the overall design of the site was costing Adi and Tamir sales. Along with a list of SEO recommendations, Stephan suggested redesign of the Tadi Brothers site. Within a month of implementing Stephan’s SEO recommendations, Adi and Tamir noticed a major improvement. Adi and Tamir had had negative experiences with SEO consultants in the past. Often, the consultants would communicate using complex technical jargon, and fail to explain the bigger picture. Stephan was different. He explained everything in plain English meaning they understood the reason for every action they were taking. As Stephan dug deeper, it soon became apparent that a large number of toxic links were pointing to the Tadi Brothers site. Links from poor quality or spammy sites can have a detrimental impact on your website’s authority and are one of the key indicators Google uses to determine rankings. It was immediately obvious that the unhealthy link profile was a major contributor to the poor performance of the site in relation to Tadi Brothers’ competitors. Indeed, many of Adi and Tamir’s major rivals are well-known brands with substantial link equity and a high level of trust within their niche. In order to compete, Tadi Brothers had to work towards a respectable link profile that matched their competitors’. The next step was a thorough link detox campaign to remove or disavow the most noxious links. Over the next few months, Adi and Tamir worked to improve their link profile by removing as many toxic links as possible, while also developing a strategy to attract higher quality links to the site. As Tadi Brothers’ link profile gradually became less toxic over the following months, Adi and Tamir noticed a substantial increase in both traffic and rankings. In just 10 months, their traffic doubled while the number of terms they were ranking on the first page of Google for had almost doubled. Best of all, the process had been an educational experience. Stephan had not only increased Tadi Brothers rankings, he had taught them SEO best practices, meaning they could continue their SEO efforts on their own.